There’s an underexplored method of deception, one used by criminals, politicians and intelligence agencies, but also by virtually everyone at one time or another: deception not through lies, but through a selective and strategic use of the truth. Back in March, I asked Twitter if there was an established word for the phenomenon. Fellow FOIA journalist Evan Anderson was able to give an answer: paltering. Paltering is a form of deception that can be somewhat intuitively understood, but is rarely examined explicitly and almost never in the context of national security, intelligence agencies or propaganda. This article aims to change that by introducing the topic in order to begin a more active discussion that will be continued on this site, and hopefully elsewhere. Paltering has been defined by Todd Rogers, a behavioral scientist at the Harvard Kennedy School, as being “when a communicator says truthful things and in the process knowingly leads the listener to a false conclusion. It has the same effect as lying, but it allows the communicator to say truthful things and, some of our studies suggest, feel like they’re not being as deceptive as liars.” The word itself seems to have been around since the 1530s. Though its exact origins are unclear, it appears to have originally meant to mumble indistinctly. At least since Shakespeare’s plays, the definition has focused on the use of vague or duplicitous language. However, it doesn’t appear to have been widely used to mean deceiving with the truth until a 2014 working draft titled Artful Paltering was released and discussed in the Harvard Gazette. The term continued to lay dormant for a few years more before resurging, 417 years after Shakespeare’s use, in the public consciousness amidst the chaos of the 2016 presidential election. It appears the paper’s specific definition of paltering may have came from Mutually Dependent: Power, Trust, Affect and the Use of Deception in Negotiation, written a few years earlier. Other studies have broached the subject without using the term, though relatively few seem to examine paltering as differentiated from lies of omission as described Artful Paltering. It’s unclear if the Harvard paper applied the word paltering to a distinction made in Mutually Dependent or if the word was actually defined in the Mutually Dependent paper. While the Harvard Gazette gave the concept of deception through truth a brief overview based on the working paper, it’s analysis was limited and largely examined the “attitudes, benefits, and risks of artful paltering.” In 2016, the term was used and examined in a slightly broader context, though most of the discussion continued to be based almost exclusively on Artful Paltering. In early October 2016, Harvard Business Review looked at the subject using the lens of the 2016 election. The article relies on Artful Paltering, giving a brief overview of how and why people sometimes palter, how it’s perceived ethically and how often it’s employed. Two months later, the Harvard Business School revisited the study in an article titled How To Deceive Others With Truthful Statements (It’s Called ‘Paltering,’ And It’s Risky). This article focused on paltering in business and negotiation settings, but seems to have been the breakout point that finally pushed the concept and term into mainstream. The Harvard Business School article resulted a Lifehacker post made the same day. Nine days later, the American Psychological Association (APA) posted a press release about the Artful Paltering paper, further highlighting it. A few days later, Artful Paltering was one of three sources cited in an article on paltering from Workplace Psychology. The brief Workplace Psychology article focused on paltering’s potential damage to one’s reputation, as well as how deception affects the brain. At the end of the month, the Artful Paltering study and the APA press release acted as the sources for a New York Times article titled When telling the truth is actually dishonest. In March the following year, the Boston Globe visited the subject, again largely referring to the Artful Paltering paper. In November, the BBC visited the phenomenon of lying with the truth and the recent proliferation of using “paltering” to describe it. The BBC article again relied on the work of Artful Paltering. While Artful Paltering is a well researched and well written paper, it is limited in scope and the follow-up studies it recommends don’t appear to have been completed and published. Artful Paltering also almost exclusively examined paltering in negotiation settings, with the papers based off of it giving occasional examples from politics, either the Clinton example cited in the paper or examples from the 2016 election. Paltering as it applies to national security and intelligence agencies continues to be largely overlooked, with discussions of it taking place almost exclusively in the context of either propaganda or denial and deception. 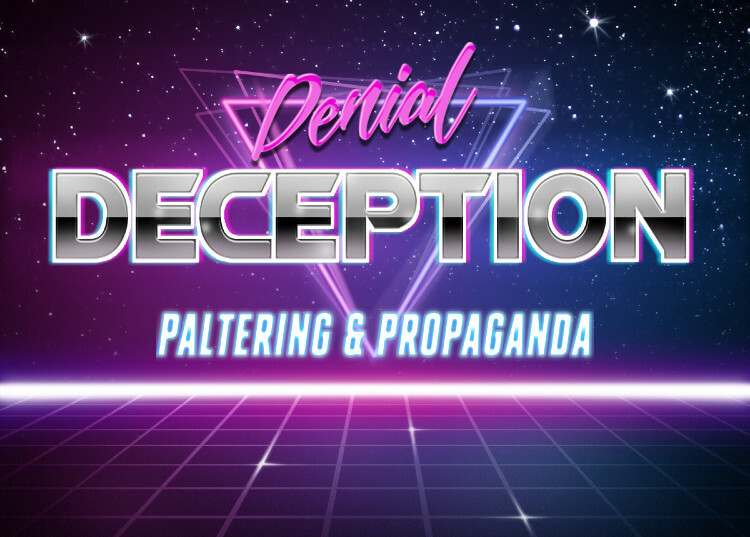 In many ways, paltering and propaganda (P&P) is a perfect counterpart to the denial half of denial and deception (D&D). Where D&D creates a deception in part by denying some information and fabricating other information, paltering creates a deception by providing true information. Frequently used in advertising, negotiations and businesses, paltering takes on a new scale and importance when employed by nation-states, and can be especially difficult to ferret out when it comes from a clandestine intelligence agency or relates to the national security and foreign policy apparatuses due to their ability to control the flow of information. Paltering takes many forms, and is often invoked because it can seem less immoral than an outright lie. While those being deceived are unlikely to react to a palter much better than they would a direct lie, the palterer and third parties are more likely to look at the situation forgivingly. For intelligence agencies, the prospect can be especially tantalizing. Since paltering doesn’t involve any direct lies, it inherently maintains a degree of plausible deniability about whether any deception was intended. It can also avoid issues of lying to the President or to Congress, which can make it an attractive option . One of the most basic and most commonly seen examples of paltering is the non-denial denial, a term which will be familiar to most journalists and anyone who’s seen or read All The President’s Men, the slightly fictionalized account of Woodward and Bernstein’s investigation and coverage of Watergate break-in and fallout. A non-denial denial is exactly what it sounds like – someone appears to deny something, without actually denying it. On closer examination, a possible non-denial denial can be recognized if it doesn’t directly and absolutely deny the accusation, something which should always prompt a follow-up query. In one example of CIA giving a non-denial denial, the Agency used it to deny a FOIA request for records about CIA use of poisons for assassinations. 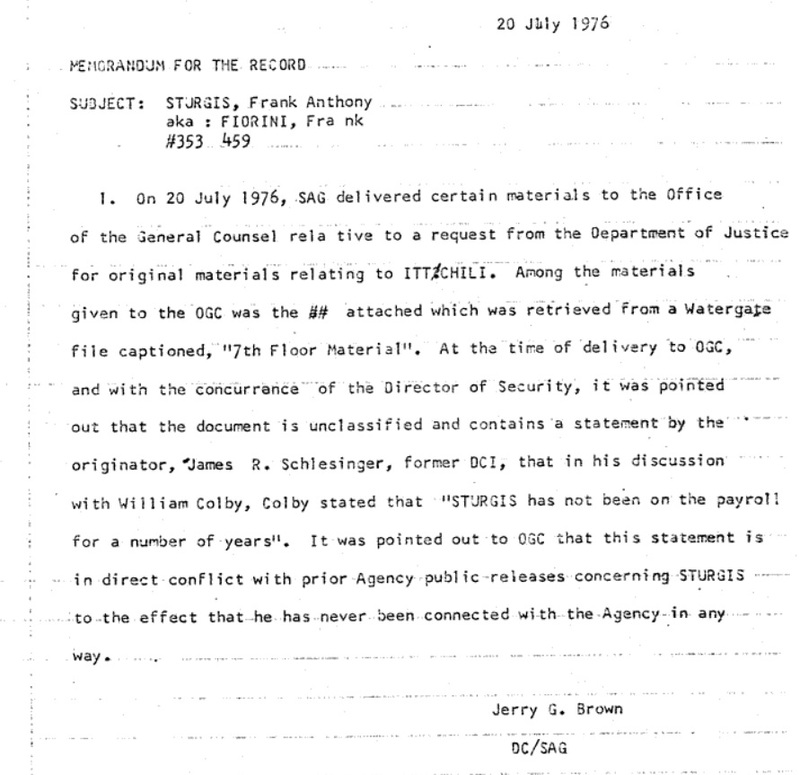 In the Agency’s (unlawful) response to the FOIA request by telling the requester to “refer to Executive Order 12333 which describes the conduct of intelligence activities, citation 2.11, which pertains to the prohibition on assassinations.” The Agency didn’t deny that records existed or that they had ever used or considered using them. The Executive Order, which was written long after CIA’s creation, simply prohibited assassinations (a prohibition that could be bypassed, if the President and CIA decided to). Dan Froomkin has examined another example of a national security-related non-denial denial over at The Intercept. The overly specific denial is even simpler than the non-denial denial, but it’s used very frequently by the intelligence agencies and national security apparatus. 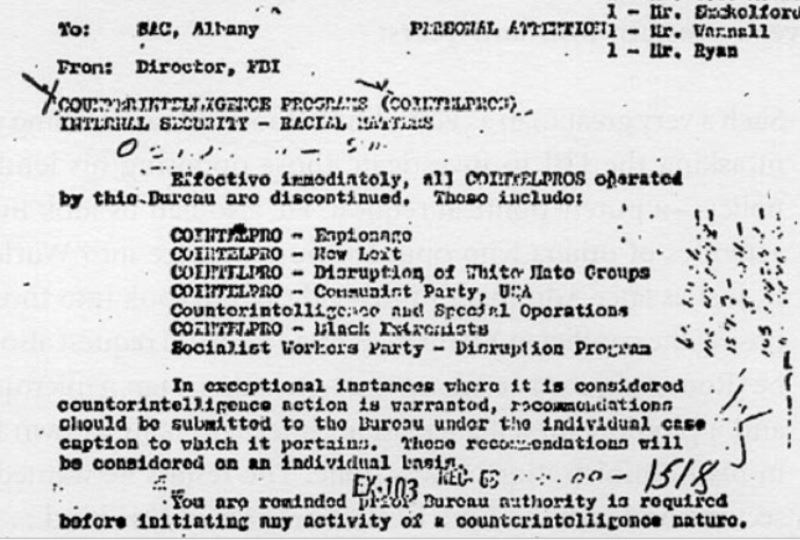 One commonly encountered, but rarely identified, example is the FBI’s discontinuation of COINTELPRO. Discussions of COINTELPRO typically note that the program was ended in April 1971, which is true. A careful examination of the memo shows that while the program was ended, it’s activities weren’t forbidden. The memo explicitly left the door open to COINTELPRO type activities, serving simply to decentralize them and make them harder to identify. The FBI’s overly specific denial is an example of how difficult it can be to spot. It can take careful thinking and a close examination to notice the distinction between the program being discontinued and its activities being discontinued and prohibited. By simply citing the truthful statement that COINTELPRO was discontinued in 1971, the FBI and its defenders are able to palter, tricking many into thinking that it’s activities ended with the centralized program. The Church Committee and subsequent journalists have independently documented that COINTELPRO type activities continued well after the centralized program was discontinued. Rather than make the case themselves, palterers can refer to the conclusions of others, despite knowing (or being, to some degree, willfully ignorant) that those conclusions are incorrect. This type of paltering uses cherry picked information. 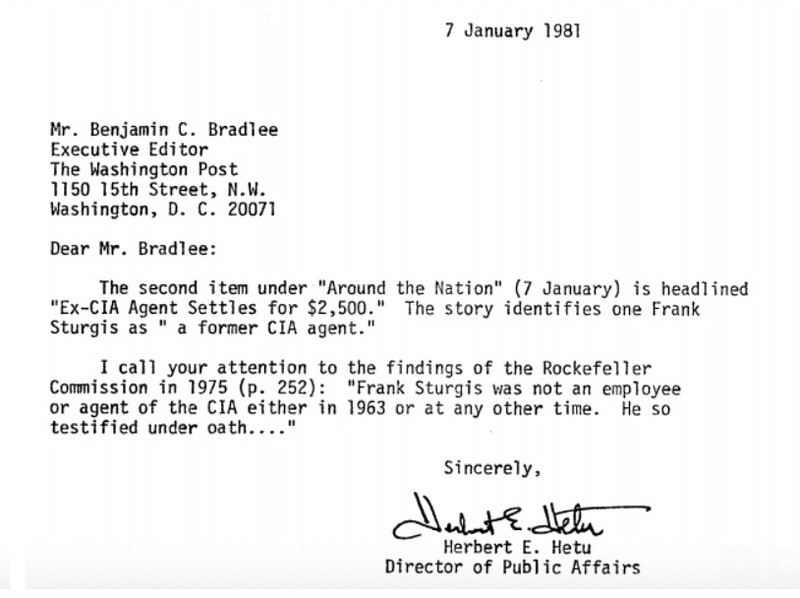 In one example from CIA, the Agency’s Director of Public Affairs responded to accusations that Frank Sturgis had been “a former CIA agent” by referring to the inaccurate conclusion of the Rockefeller Commission. The Director of Public Affairs never denies the accusation or makes any assertion beyond quoting the Rockefeller Commission’s findings. Previously, CIA had privately acknowledged that Sturgis had been on the Agency’s payroll and that this contradicted the Agency’s prior releases. This information was either ignored by or denied to the Director of Public Affairs, resulting in a true statement being used to convince someone of false information. Paltering can be and often is used for propaganda. In this form, paltering can be especially insidious and difficult to dispel. Perhaps counterintuitively, P&P can thrive on in an abundance of information rather than an extremely limited selection. Perhaps the most easily recognizable examples surround the JFK assassination. Due to the repeated government investigations into the assassination, numerous FOIA requests and especially due to the JFK Records Act, a wealth of information is available to the public (despite some notable exceptions). Each of these millions of pages of documents can be used as ammunition for someone to push an agenda – typically to accuse an antagonist or acquit an ally. The JFK assassination highlights just how complicated the issue can become. Using only accurate information – which can include citing actual documents that contain inaccurate information, i.e. “according to an FBI memo…” – it’s possible to walk a neophyte to any conclusion that one desired. This can be simple for a nation-state to weaponize, an easy to attack the reputation of any country, intelligence agency or organization that found someone laying guilt at their feet. Paltering can be used simply to promote any propaganda narrative that disparages an opponent while promoting its cause. This is one of the more insidious forms of propaganda, because it simply uses the truth (or pieces of it) to push a particular bias rather than an outright falsehood. One form of P&P can be found in conspiracy theories like the Pizzagate phenomenon. A great deal of information cited by the Pizzagate proponents was accurate, it was simply assembled incorrectly in a way that could be seen to support an outrageous conclusion. While there were some forgeries created by 4chan-type hoaxers (and some false assumptions, such as that the pizzeria had a basement), a great deal of the material presented by Pizzagate supporters came from actual emails in the Stratfor, DNC and Podesta email releases published by WikiLeaks. This narrative was used to undermine a candidate’s campaign during the 2016 election, and was persuasive enough that a man decided to “investigate” the affair by firing a gun inside the pizzeria. The Pizzagate phenomenon shows how powerful paltering can be. Supplemented by a handful of outright untruths, conspiracy theorists paltered (some wittingly, some unwittingly) an outrageous and unreasonable accusation into a belief widespread enough that its name is instantly recognizable throughout the United States. Chicken feed is an example that ultimately unites paltering and outright lies by using the former to build credibility for the latter. The chicken feed doesn’t have to help sell the deception itself; the two can be entirely unrelated except for their source. The true information – the chicken feed – is used to incorrectly convince the recipient that the source is credible and can be relied upon. The source, often a false defector or double agent acting as a source of disinformation, convinces the listener to put them in a position of trust they can exploit to deceive and/or manipulate their targets. Although chicken feed is a term associated with being used by intelligence agencies targeting opposing agencies and governments, it can be and has been used against the public and the press. It’s easy to imagine how building up a reputation with accurate information can easily be exploited by selling a particular journalist, or the public in general, on one’s trustworthiness. Although chicken feed is typically low value information, reputation hacking through paltering can use more significant and damaging pieces of information. 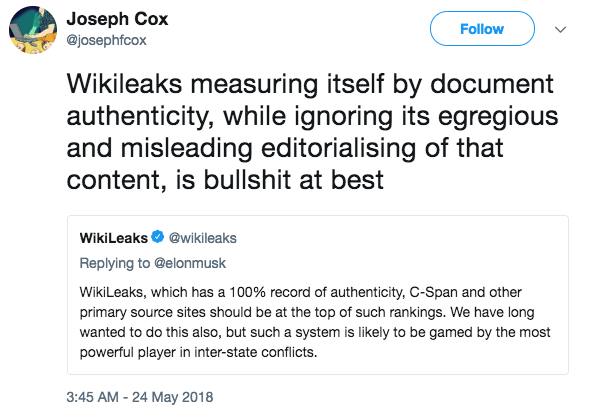 As some have noted, WikiLeaks has used the credibility they gained from releasing authentic documents to provide misleading editorials and descriptions of that information. In one egregious example, WikiLeaks’ paltering description of their documents left many, including some journalists, with an impression that simply wasn’t accurate. As the New York Times explained, WikiLeaks’ conclusion misled readers into thinking that encryption apps had been compromised. In reality, the Times pointed out, the documents “confirm the strength” of the encryption. Regardless of what WikiLeaks’ intent was with their tweet and editorial, it provides a case study in which accurate information (i.e. documents) was used with a particular framing to convey an inaccurate narrative, one which many uncritically repeated without providing proper context. Accusations of paltering have been used in attempts to discredit information or limit its reach and impact. Several high profile hacks and subsequent releases have resulted in assertions that while some of the information is genuine, some of it is or may have been modified or fabricated. Specifics are rarely provided, both because confirming and denying every piece of information is exhaustive and counterproductive, and because refusing to can call all of the information into doubt unless it’s otherwise verifiable. Ironically, these kinds of accusations of paltering can be used for a sort of counter-palter. If one forged or modified item can be found, it can be used to call into question the authenticity of accurate pieces of information. An individual or organization may know that something is true, but choose to attack the credibility of something by accurately pointing out that something else the source said or published was inaccurate. Paltering is pervasive, and it can be difficult to spot and even more difficult to counter. A well coordinated P&P campaign might not be discovered or fully exposed for years or decades after they occur, and the effects can linger far longer – especially when paltering influences policy. There is no easy defense against P&P, simply thoroughness, specificity and a willingness to question assumptions and prior conclusions. Addressing the issue requires more than an intuitive understanding of paltering, it must be discussed. This article is obviously not the end of that discussion, but an attempt to begin it by articulating the issue as it applies to national security and intelligence agencies, and how P&P compliments and acts as a counterpart to the much more widely discussed denial portion of D&D.